Week 14’s Angel is Valerie Jones. She has been nominated for uncovering kindness by her husband Roy Jones. Valerie was born in Gladstone and at one stage 8 generations of her family were alive and living here! Val started her volunteer journey back in 1982 at the Blood Bank after she had given up work and a friend asked her to help. “Back then it only ran of a night time. Once a week I would go into the centre in the morning with the manager, Joyce. We would prepare the day ahead, ring donors and confirm appointments by phone and get ready for the busy night ahead. I used to take blood pressure, rock the blood bag and take the needle out and wrap the arm. “ Val had a short break from the centre after her father passed and she was caring for her mum in a wheelchair. She soon returned after the passing of her mum and to this day, goes in every fortnight with her husband Roy, to help with the preparation of the blood boxes. In March 2012, Valerie started volunteering at Evenglow. 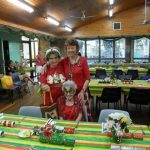 This group runs a day out for the elderly in aged care every fortnight on a Wednesday at the Seniors Citizens Hall. The volunteers arrange morning tea, an hour of hoy, an hour of entertainment and a 2-course lunch to follow. 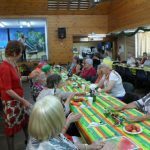 When I met for a chat with Val, she and Roy had just finished up an early Anzac Day themed and inspired lunch at Evenglow, where they had speeches and traditional Anzac Day celebrations. Later in 2012, Valerie also started to spend her time at Blue Care on Tuesdays where she sorts through the clothes and stock that comes in. She gets rid of the stuff that isn’t saleable and brings home items that can be ‘mended’ and then takes it back to be sold. Every 5 weeks Valerie oversees the jewellery and doll sales at the Blue Care Auxiliary Garage Sales, and the exciting part is Valerie gives all the baby dolls and toys of Blue Care a makeover, and a chance at a new home. 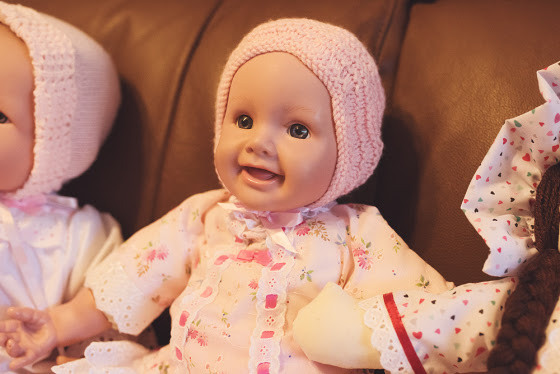 Val takes the dolls, and the clothes they come in, and soaks them for 2 days. She cleans them and mends everything that needs to be fixed. If the body isn’t salvageable, Val makes a whole new body. 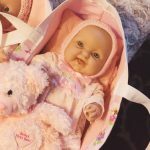 She sews, knits or crochets booties, undies, dresses and bonnets for each doll and in some special cases makes a carry bag, mattress, pillow and crocheted blanket as well. Then she dresses the dolls and prices them to suit. The dolls are then taken back to Blue Care and sold. 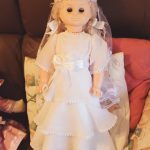 All the work, time and the materials that go into these dolls are donated by Valerie and she doesn’t want anything for them. 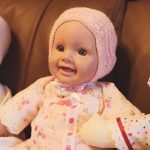 She gives all the proceeds from these recreated dolls back to Blue Care. Val, it was an absolute joy to meet with you and find out what you do in your spare. I hope that you keep being the beautiful person you are and volunteering in the community for many years to come.